When I suggested a few days ago that some of the restlessness exhibited by our pioneer forebears might be explained by their need to stay one step ahead of bill collectors, I wasn’t just whistling in the wind - I had a specific example in mind. Laura Ingalls Wilder once admitted that even honest Pa Ingalls, unable to come to agreement with his landlord, once had to pack up the wagon, load the family on board, and slip away in the dead of night. The upcoming release of an annotated biography of Laura Ingalls Wilder called “Pioneer Girl” has led many writers to revisit the author’s life and works. Several websites have introduced readers to a speech Ms. Wilder gave at a book fair, in which she revealed that although she stood by the truth of all the stories in her books, she had not told everything. There were some stories that weren’t suitable for young readers. There was the story of the Bender family that belonged in the third volume, Little House on the Prairie. The Benders lived halfway between it and Independence, Kansas. We stopped there, on our way in to the Little House, while Pa watered the horses and brought us all a drink from the well near the door of the house. I saw Kate Bender standing in the doorway. We did not go in because we could not afford to stop at a tavern. A few commentators question her reminiscence about the Benders, pointing out that the timelines of the Ingalls family and the Benders in southeast Kansas do not quite intersect. Objections arose because Ms. Wilder remembered her family’s departure for Wisconsin occurring soon after the birth of her sister Carrie, who was born August 3, 1870, while graves were not discovered in the yard around the Bender cabin until 1873. However, the first members of a band of German immigrants who became known as the Benders, arrived in Labette County, Kansas, with a group of fellow spiritualists in the fall of 1870. The Bender men built a cabin that fall that would also serve as an inn, and the ladies arrived in December. According to a 2001 study of Ms. Wilder’s book in “Kansas Settlers on the Osage Diminished Reserve," the Ingalls family could have departed Montgomery County as late as May 1871, around the time the body of a traveler whose throat had been slit, turned up along the Osage Trail that ran between Fort Scott and Indian Territory. Charles Ingalls may not have joined a vigilante group that cleaned out the Benders, but he could have served his family water from their well. The four newly-arrived German spiritualists who called themselves the Benders, generally posed as a traditional family, a middle-aged mother and father and their two grow children, John Jr. and Kate Bender. There is some speculation that only two of the group were related by blood, Ma and Kate, while the younger man may have been Kate’s husband or paramour. Of the four Benders, Kate was the most prepossessing and outgoing, had the least-noticeable German accent, and was reputed to conduct spirit readings in the Bender inn. The inn must have been a welcome respite for weary travelers on their way to conduct business in Indian Territory, their wallets stuffed with enough cash to buy a string of horses. Men who dined at the inn and lived to tell about it, suggest that likely-looking victims were seated in the "place of honor," their backs to a canvas partition that divided the dining room. Kate Bender chatted up the visitor, inquiring whether he was a stranger in these parts or had family living nearby, and what his business might be. If the diner's answers suggested that he was carrying greenbacks and would not be missed immediately if he disappeared, Kate gave a sign to one of the male Benders to burst through the curtain and bash the victim’s skull with a hammer. Then someone would cut his throat just to make sure, and the body was shoved through a trapdoor leading to the cellar. While searching for information about the Lovewell brothers and their adventures in the West, I’ve had my own near-misses with the Benders many times over the past few years. Having heard a reasonably full account of their story some twenty years ago, whenever I came across a vintage news item breathlessly announcing that the family had been captured and were awaiting extradition, or a posse had surrounded their hideout, or their new identities had been discovered, I knew better. There are songs and books about the Benders, and interest in them has grown in recent years. They were featured last summer on the “Investigation Discovery” cable channel, and there is renewed talk about a feature film. Many websites are dedicated to delivering gory details concerning the fate of their eight or ten probable victims and some ten or twelve others who are presumed to have died at their hands. Most of these contain pictures like the ones on this page, ancient sketches of the family, a fuzzy photo of the cabin, or a crisp one showing the bodies disinterred from the yard. A few other sites feature what are purported to be likenesses of the Bender family, photographs of unknown provenance. 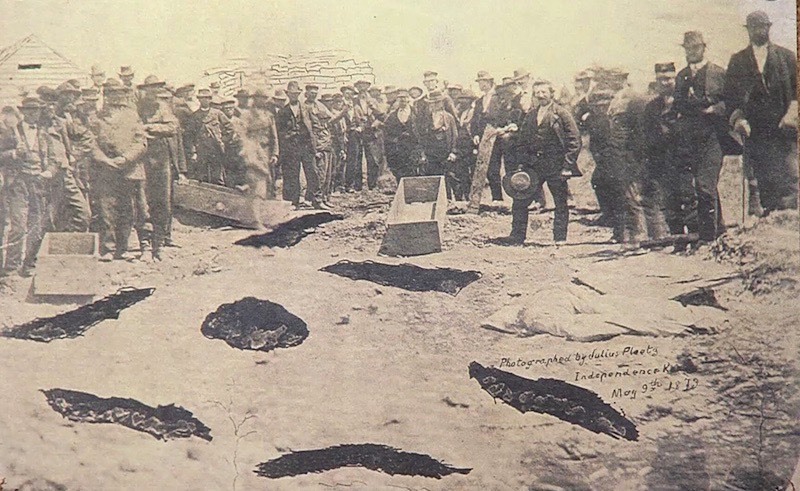 What actually happened to the Benders is the stuff of folklore and tall tales. There was talk that vigilantes had quickly caught up with the murderous family after their deeds were discovered, and delivered peremptory justice. The most colorful and far-fetched story had young John Bender, the last surviving member of the clan, crashing his balloon on the deck of a ship just in time to make a dying confession before the vessel sank, sending the balloon and the corpse of John Bender into the deep. It was the end of the Bender saga as Jules Verne might have written it. There is also a family-history angle to the tale. A little museum at Cherryvale, Kansas, harbors some Bender memorabilia, hammers and such that the family left behind when they fled. Is that a drop of blood on the knife reputed to be the throat-slitter? It’s probably only a spot of rust, and the knife itself seems more suitable for slicing off a pat of butter than snuffing out the life of an unsuspecting traveler. The museum was recently able to install a new exhibit. A Minnesota woman searching a genealogical website decided that she was almost certainly the great-great-granddaughter of the notorious Kate Bender, and shipped the museum a set of family photographs which she no longer wanted polluting her home. Both families, Ingalls and Bender, polar opposite symbols of sweetness and darkness, one family facing hardships bound together by love, and the other a family from Hell, continue to be celebrated with books and museums and a pair of roadside markers which, bizarrely enough, lie a mere twenty minutes apart in southeastern Kansas. Whether four-year-old Laura Ingalls remembered the incident correctly or not, the very possibility that the two families once crossed paths and regarded one another for a few minutes from a short distance, is a scary notion.